But what was missing in his masterful oratorical speech—something that most immigrant families were expecting to hear—was about comprehensive immigration reform, which so far he has failed to introduce in congress. 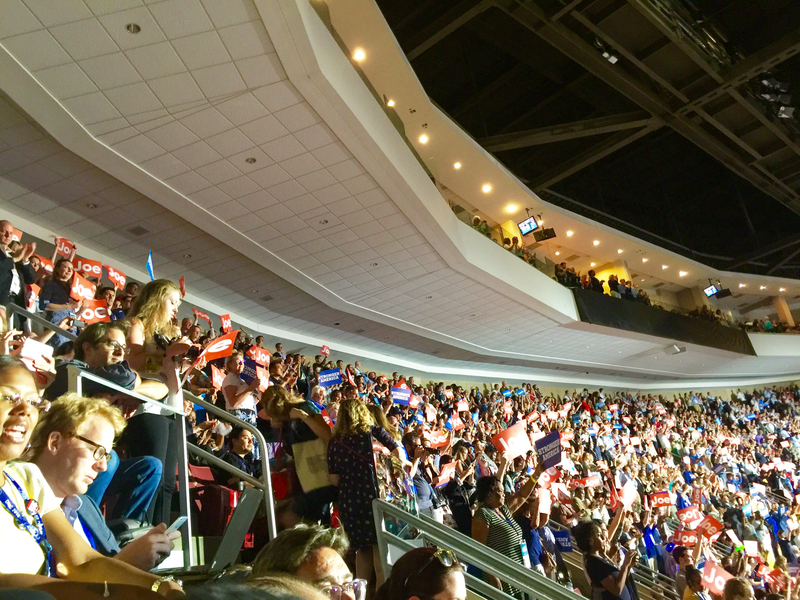 For undocumented immigrants—a number of them attending the convention—the narrative on immigration that Democrats are playing out here has an air of deja vu. Eight years ago, when Obama first ran for president, undocumented immigrants heard what they have always been longing for: a policy that would provide them a path to legalization. 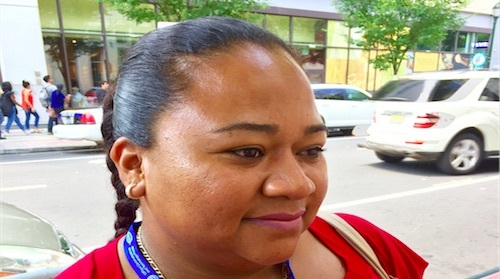 Estela Hernandez, an undocumented mother from Oaxaca, Mexico and now lives with her family in Philadelphia, PA, is worried that the immigration issue might be just another election rhetoric that Democrats use, though nothing has been done since a comprehensive immigration reform plan—which was introduced by Pres. George W. Bush—died in the senate in 2007. In 2005, Hernandez, 35, crossed the U.S. border by walking through the desert with one of her three children—now ages 12, 10 and 7—to reunite with her husband and their father, who also crossed the border two years earlier. She could have been a recipient of the Deferred Action for Parents of Americans and Lawful Permanent Residents (DAPA), a part of Obama’s executive action on immigration that would provide A work authorization document for eligible undocumented immigrants, because two of her children were born in the United States. Obama’s executive order hit a deadlock in the Supreme Court last month. Facing strong anti-illegal immigration sentiments from many Republicans, Hernandez said that it is important for “all politicians to see undocumented immigrants as people” and eradicate hatred in their speeches. Also, a few minutes before Obama took the stage, Democratic Vice President nominee Tim Kaine, a senator from Virginia, delivered part of his speech in Spanish, a move to embrace and attract Latino voters. When he lived in Honduras, Kaine said, he learned that the best compliment anyone could give to someone was to say “listo” or ready. Despite her hardships and fear of deportation, like the predicament that 11 million undocumented immigrants are in, Hernandez believes that many Latinos are going to vote for Clinton in November. Will the United States Supreme Court decide President Obama was within his right to grant deferred deportation to some persons in the country illegally because the Congress has been unable take action to reform the nations immigration programs? Or will the Court copy the Congress and be unable to reach a majority decision to resolve the immigration case before them? At issue before the Court is whether President Obama acted within his Constitutional authority when granting temporary relief from deportation to millions of immigrants within the country without legal authorization, and whether Texas and 25 other states will be harmed by those actions. Under the president’s executive actions, deportation relief would not be granted to every person in the country illegally, but rather to a select group of non-criminal immigrants who have set down roots in the country, pay taxes, attend school, and are considered a low-priority for deportation by Homeland Security. The fact is, by only allocating enough funds to deport approximately 400,000 of the estimated 11 million immigrants in the country without authorization, Congress has made a de facto decision to allow millions of the immigrants to remain here. The claim by Texas and the other states that they will be harmed by the president’s actions makes no sense to us. The federal government did not mandate that they pass a law granting driver’s licenses to non-citizens legally present in the country. They did it on their own. The notion that Obama’s executive actions will cause the state financial harm is at best speculative. On what grounds the justices could find that a state suffered harm by having licensed people on the road, or non-citizen workers paying state, local and federal taxes, isn’t clear to us. We have said before and say again, we believe President Obama was well within his legal prerogative when he granted temporary relief from deportations to people brought to this country as children through no choice of their own, and to the parents of children born in the U.S., and permanent residents. We don’t believe the President’s actions are changing, throwing out, or usurping the immigration laws of this country, as unworkable as they may be. What the President is in fact doing is stepping in to upend a stalemate no one in this country is very happy about. Not even a Republican led Congress should be able to wait for the other side to drop on immigration. Now let’s hope the Supreme Court justices do what’s right and let the president’s executive actions stand. Click here for the complete transcript of the oral arguments made before the United States Supreme Court. The atmosphere was celebratory, as if they had already won. In reality, victory, defeat or a draw in a case that could determine the future of millions of immigrants in the country illegally is likely still months away. On Monday morning — in front of the U.S. Supreme Court in Washington D.C. and in dozens of cities across the country — thousands of immigrants and their supporters rallied in support of President Obama’s executive actions giving four million undocumented immigrants temporary relief from deportation. 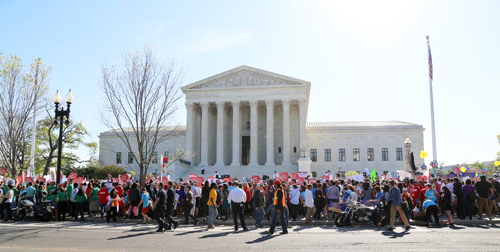 The rallies took place as the high court’s eight justices listened to oral arguments in United States v. Texas, a lawsuit challenging the constitutionality of the president’s authority to bring the actions. Questions raised by the eight justices seem to indicate they are deeply divided 4-4, with the four conservative justices leaning toward upholding the lower court’s ruling. Defending the president’s actions, petitioners questioned whether Texas and the other states have standing to bring the lawsuit. In May 2015, a Fifth Circuit Court of Appeals panel in New Orleans upheld an injunction issued by a U.S. District judge in Texas in a lawsuit filed by Texas and 25 other Republican leaning states seeking to halt Obama’s executive actions on immigration. The states argued that Obama overstepped his legal authority when he took the executive actions, insisting he does not have the ability to unilaterally set immigration policy. The legal wrangling has suspended implementation of a program that would extend work permits and protection against deportation to parents of U.S.-born children and expand the existing program for immigrants who arrived illegally as children. The programs – often referred to by their acronyms, DAPA and DACA – would affect an estimated half-million Angelenos. Congressman Xavier Becerra (D-34), whose district includes parts of East and Northeast Los Angeles, was in the Court for oral arguments and told EGP following the proceedings that the justices were attentive to both sides presenting arguments. They asked very important questions, such as “how do you define lawful presence?” and “how do you treat the issue of removal [of undocumented immigrants]?” if it was to happen, he said. For Becerra, the threshold is whether Texas even has the right to bring the case to court, “because [they] have to prove that the state will be harmed” by the measures. In 2015, Texas argued that the state would suffer financial harm due to a Texas policy that allows the state to issue driver’s licenses to noncitizens lawfully living in the state. Undocumented youth who qualified for DACA in 2012 were not initially allowed to apply for a Texas driver’s license, but that changed a year later when the Obama Administration confirmed that DACA recipients are authorized to be in the United States and therefore considered to be “lawfully present” under federal immigration laws. “There are vast numbers of people under existing Texas law that are eligible for a license even though they are not lawfully present,” Verrelli said during the 90-minute session. He argued that Texas could change its law to deny driver’s licenses to immigrants. “You would sue them instantly,” Chief Justice John G. Roberts responded. It’s “a real catch-22,” he said, referring to the possibility of the federal government suing Texas over its unequal treatment of immigrants deemed lawfully present in the country. Speaking in defense of the president’s actions, MALDEF President and General Counsel Thomas A. Saenz presented testimonials from three unauthorized immigrant mothers –identified as Jane Does – who would benefit from DAPA, defended the executive actions. “The justices seemed closely engaged throughout the entire argument,” Saenz said during a telephone news conference following oral arguments. It was necessary to bring the “human faces” of those who are being put at risk, he added. “Without their participation, the only parties would be political, so it was important to have the perspective of those who are waiting,” he told reporters. The death of Justice Antonin Scalia earlier this year has left the court divided 4-4 along partisan lines. If the conservative/liberal split holds, a 4-4 decision would allow the lower court’s decision to stand. “There would be consideration of what could be done, in court or otherwise, to limit the scope of the nationwide injunction barring implementation of the guidance everywhere” in response, Saenz explained. Plaintiffs in the case also claim that the immigration orders by President Obama represent a drastic change in the country’s policies without the authorization of Congress. It’s an argument backed by California Congressman Darrell Issa (R-49) who represents the coastal areas of San Diego and Orange counties. “The Constitution couldn’t be any clearer. It’s Congress’s job to write the laws and it’s the President’s job to see that they are faithfully executed,” said Issa in a statement Monday. Justice Anthony Kennedy seemed to agree. “It’s as if the president is setting the policy and the Congress is executing it. That’s just upside down,” said Kennedy, typically the court’s swing vote. A coalition of 15 states, including California, plus the District of Columbia and 118 cities and counties, however, have demonstrated support for the president’s actions. In the friends-of-the-courts briefs, supporters of the president’s executive actions argue that his directives would not harm the 26 states seeking to overturn them but instead would be of substantial benefits not only to undocumented immigrants and their families, but to government coffers as well. The brief, which was co-drafted by Los Angeles Mayor Eric Garcetti, City Attorney Mike Feuer and their New York City counterparts, also points to the potential “economic harm” of not allowing taxpaying immigrants to work and stay in the country. Obama’s executive policies are expected to inject as much as $800 million in “economic benefits” to state and local governments, according to the brief. Congresswoman Lucille Roybal-Allard (D-40) who represents East L.A. and parts of Southeast and South L.A. said in a statement that President Obama’s executive actions to expand DACA and implement DAPA are not only legal, but also humane. A final ruling is expected in June. Update 3:45 p.m. April 22, 2016: An earlier version of this story misspelled the names of Congresswoman Lucille Roybal-Allard and Darrell Issa. California and the city of Los Angeles have joined 15 other states, the District of Columbia and 118 cities and counties urging the U.S. Supreme Court Tuesday to lift an injunction on President Barack Obama’s executive actions shielding certain undocumented immigrants from deportation. In separate amicus briefs they asked the Supreme Court to reverse an injunction in the case of United States v. Texas, upheld by the U.S. Court of Appeals for the Fifth Circuit, thereby prohibiting the federal government from implementing immigration directives announced by the president in November 2014. The injunction was issued against Deferred Action for Parents of Americans and an expanded version of Deferred Action for Childhood Arrivals, which call for deferring deportation proceedings and granting work permits to two groups of people: those who were brought illegally to the country as children and the undocumented parents of citizens or green card holders. In the “friends-of-the-courts briefs,” supporters of the president’s actions argue that his directives would not harm the 26 states seeking to overturn them but instead result in substantial benefits not only to undocumented immigrants and their families, but to government coffers as well. “President Obama has proposed common sense actions on immigration, which will allow millions of hard-working immigrants to come out of the shadows, contribute to the prosperity of this nation and build their American Dream,” California Attorney General Kamala D. Harris said Tuesday in a news release announcing the state’s court filing. Los Angeles Mayor Eric Garcetti and City Attorney Mike Feuer – who co-drafted the brief with his New York counterparts — said Tuesday that by preventing the executive actions from moving forward, “integral” members of their respective cities and communities would be harmed. “Without the guidance, millions of families in our cities and counties face the threat of deportation, destabilizing our communities and jeopardizing the welfare of families and children,” according to the brief. The multi-state brief argues that the president’s immigration directives will benefit the states and further the public interest by allowing qualified undocumented immigrants to work legally and better support their families. As a result, the brief argues, state tax revenue will increase, public safety would be enhanced and tragic situations in which parents are deported away from their U.S. citizen children, who are left to rely on state services or extended family, would be avoided. The brief filed by Los Angeles and other cities and counties also points to the potential “economic harm” of not allowing taxpaying immigrants to work and stay in the country. Obama’s executive policies are expected to inject as much as $800 million in “economic benefits” to state and local governments, according to the brief. Also filing amicus briefs Tuesday was a diverse coalition of 326 immigration, civil rights, labor and social service groups, and a group of Catholic, Evangelical, Protestant and faith-based organizations. “If the injunction is lifted, many families will be more secure, without the looming threat that loved ones will be deported at a moment’s notice,” according to the civil rights groups: National Immigration Law Center, the American Immigration Council, the Service Employees International Union, the Advancement Project, LatinoJustice PRLDEF, the Leadership Conference on Civil and Human Rights and Mi Familia. “Many deserving individuals will also have access to better jobs and the ability to improve their lives, the lives of their families, and their communities. DHS has discretion to grant or deny applications for the initiatives at issue, and the concocted argument to the contrary should not be used to prevent individuals from even applying,” the coalition said. “The lives of real people and their American-born children — not some political targets used in talking points on a campaign trail — are at stake in this case,” stated Rocio Saenz, executive vice president of the Service Employees International Union (SEIU). Most of the families who apply under the president’s directives include American citizens, including children of DAPA parents who will be voting on behalf of their families this November, according to Ben Monterroso, executive director of Mi Familia Vota. “They are already part of our communities, of our churches and schools, and of our local workforce. We should embrace their contributions that benefit all of us, instead of trying to rip apart their families,” Monterroso said. Bill Canny, executive director, Migration and Refugee Services for the U.S. Conference of Catholic Bishops, in a written statement said the “human consequences of our broken immigration system” is witnessed every day at U.S. Catholic Church’s social service agencies, hospitals, schools, and parishes. “We urgently need relief and justice for our immigrant brothers and sisters and a legal process that respects each person’s dignity, protects human rights, and upholds the rule of law. Although far from ideal, DACA/DAPA does that by keeping many families together and protecting children,” Canny said. Reversing the lower court’s decision will allow approximately 5 million people, including 1.2 million Californians, to apply for protection from deportation and work authorization, according to California’s Attorney General. Similar amicus briefs were submitted by Los Angeles city officials and others at previous stages of the case, including when the U.S. Supreme Court was still considering whether to take up the issue. The Los Angeles County Board of Supervisors voted Tuesday to sign on to an amicus brief urging the U.S. Supreme Court to review the decision blocking President Barack Obama’s executive action on immigration. If the U.S. Supreme Court agrees to review Texas v. United States, county counsel has been directed to join Los Angeles, New York and other jurisdictions and organizations who have added their names to the amicus brief, which seeks to reverse the Fifth Circuit’s decision. “It is important for Los Angeles County to voice its support because immigrant integration is about laying the foundation for equality and justice,” said Supervisor Hilda Solis, who introduced the motion. Mayor Eric Garcetti Tuesday was soliciting signatures from Angelenos to support President Barack Obama’s executive actions that would put deportations on hold for some immigrants who came to America without proper authorization. Obama’s expansion of his Deferred Action for Childhood Arrivals, or DACA, program for people brought to the United States as children, and a new program that applies to parents of U.S. citizens and permanent residents, were set to start earlier this year, but were halted after the actions were challenged in a Texas court. Garcetti plans to send his Immigrant Affairs chief, Linda Lopez, to New Orleans to hand-deliver the petition to the Fifth Circuit Court of Appeals today, ahead of oral arguments starting on Friday. The petition is at http://www.lamayor.org/daca_works. recent decisions by the U.S. Supreme Court. Shouting “Shame on you” and “Si se puede” (Yes, we can), immigrant rights activists, elected officials and union leaders rallied outside Los Angeles City Hall Tuesday to decry a federal judge’s ruling putting the president’s executive immigration orders on hold. On Monday, U.S. District Judge Andrew Hanen in Texas issued a ruling stalling President Obama’s executive orders, which would protect an estimated 4 million to 5 million immigrants living in the country illegally from deportation. Hanen’s ruling was made in response to a lawsuit filed by 26 states to try to permanently stop the president’s orders. The U.S. Department of Homeland Security announced it would delay implementation of the expanded Deferred Action for Childhood Arrivals program until further notice, putting the application process that was to have started Wednesday temporarily on hold. However, applications from people who qualify under the original DACA guidelines issued in 2012 will still be accepted. Cedillo said Hanen and Texas Gov. Greg Abbott should review “what part of legal” they don’t understand. “Shame on you for failing to recognize the laws and this president. You should not engage in partisan politics,” Cedillo said. The DACA expansion, which was set to start Wednesday, removes the 30-year age limit, allowing immigrants who came to the U.S. before Jan. 1, 2010, and were 16 or younger when they arrived, to apply for relief from deportation and authorization to work in the country legally. According to the Pew Research Center, about 330.000 undocumented immigrants would benefit from the expansion. “We are really going to fight for our dreams, we are not giving up,” said Erica, who said expanding DACA would have allowed her to get in to the medical field. The second part of the executive action, known as the Deferred Action for Parents Arrival (DAPA) —estimated to begin in May—also provides deportation relief and work authorization to parents of U.S. citizens or legal residents who have been in the country since 2010. Norma Torres is undocumented and told EGP she was shocked by the judge’s action. She said she personally would have benefitted from DAPA, and she’s committed to keep fighting to make it happen. “This is just an obstacle,” she said. Representatives of the American Civil Liberties Union noted that the judge did not rule on the states’ assertion that the president’s immigration actions were unconstitutional. The judge only issued an injunction blocking their implementation while the lawsuit was pending. “The decision is very narrow, holding only that the federal government may have failed to follow procedural requirements before implementing” the orders, according to Cecilia Wang, director of the ACLU’s Immigrants’ Rights Project. On Tuesday, the White House announced it plans to appeal the ruling. It will be heard by the 5th U.S. Circuit Court of Appeals in New Orleans. She called on parents who will benefit because of a child’s legal status, to get them to register to vote if they are 17 or older. “Have them vote for you, [in 2016] so that Republicans understand that they cannot attack our families,” she said. In the meantime, pro-immigrant rights groups said people eligible for legal status under either of the orders should continue to prepare to apply. Make sure you have all the right documents, said Martha Arevalos, executive director of the Central American Resource Center (CARECEN). Legislators from those states have tried to block implementation in Congress with amendments to the appropriations bill to fund the Dept. of Homeland Security. Texas Gov. Abbott hailed the judge’s action. “We live in a nation governed by a system of checks and balances, and the president’s attempt to bypass the will of the American people was successfully checked today,” Abbott said. Rep. Xavier Becerra, D-Los Angeles, said he was still confident the immigration orders would be ultimately upheld.